Saucony pro athlete Tim Reed ruled the Cobra Ironman 70.3 with a strong first place finish held last August 2 in Cebu City. 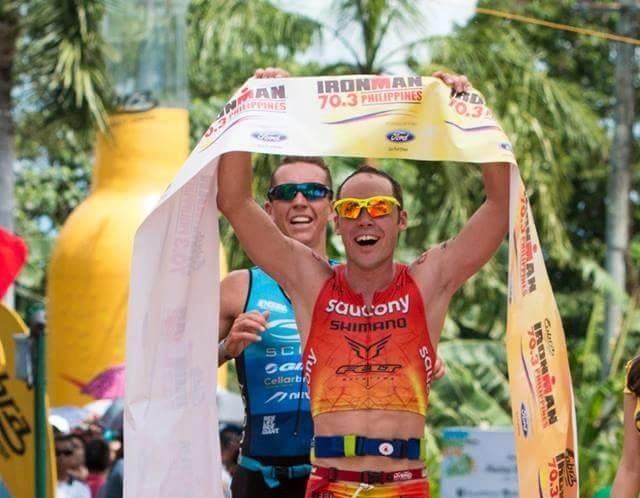 Following his historic inaugural win at the Century Tuna Ironman 70.3 last March, the Australian athlete and reigning Asia-Pacific Ironman 70.3 champ once again showcased his prowess in speed and endurance as he crossed the finish line in an outstanding 3:46:03 record time. “The heat and the humidity just make it really difficult. But you know the toughest races are always the most memorable and it was such a world-class field today,” says Reed. Besting world-class triathletes such as Craig Alexander, Brent McMahon, Pete Jacobs, and Luke McKenzie, Reed says his biggest competition was fellow Aussie and best friend Tim Van Berkel, who finished second for the men’s coveted title. Reed crossed the finish line two seconds ahead of Van Berkel in what Reed considers as “one of the toughest battles” he’s ever had. The Cobra Ironman 70.3 in Cebu City continued to be a premier triathlon event in the country with the largest participant turnout of 2,618. Finishers in the relays include Saucony athletes John Chicano from the Philippines and Sam Betten from Australia. Betten successfully hit the 9th over-all ranking geared with his Saucony Fastwitch 7 which is known for its excellent traction and responsiveness. Known for equipping the world’s best athletes with award-winning running shoes, global performance brand Saucony headlines the banner for the choice footwear for triathlons. Racing for Saucony, Tim Reed once again dons Saucony Type A6, the very pair that propelled him to his spectacular first place finish at the Century Tuna Ironman 70.3. The Saucony Type A6 has since become a favorite among elite athletes with its exceptionally engineered comfort and lightweight support. Triathlon athletes and enthusiasts alike can anticipate for another showcase of exceptional performance and footwear by Saucony as Cebu City hosts the 2016 Asia-Pacific Ironman 70.3 by August next year.